A lot of people don’t really bother putting much effort into protecting their sheds. Besides, it’s just mostly some garden tools and unused clutter, right? But regardless of what’s inside of your garden storage, it’s still important to make sure you have a secure garden shed at all times. No matter what you put inside your shed, it should be given the same level of security as your house and other properties. This is more essential during the holidays when you go on a vacation and no one is left at home. 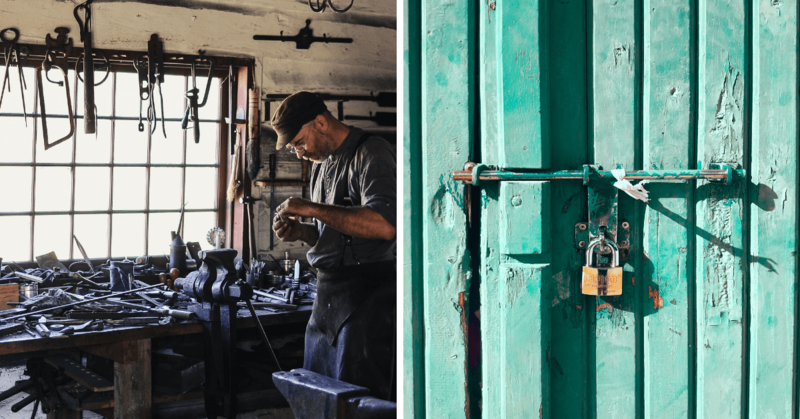 This guide will make you aware of the common mistakes when securing sheds, as well as the corresponding solutions that will mitigate the risk of breaking into the structure. If your shed has been hanging around for a long time, it might already have some loose slats or rotten timber. That means you old, worn-out shed will have little to no defense against thieves. The first thing you need to do is to look out for any problems with your shed. Immediately fix any loose slats and use new panels to reinforce the internal structure of the shed. Make sure to also replace any damaged window frames or doors, and cover up any holes on the roof. Make it look difficult for bad guys to access your shed at first glance. You can plant thorny bushes around the structure which will serve as a deterrent. Also, keep the fence openings closed and secure at all times, and if you have overgrown shrubs around the shed, trim them regularly so that it can’t be used for hiding. Weak locks and clasps on your shed door indicate that it can easily be broken by burglars. Traditional locks are still efficient, so you can replace old fasteners with a reliable hasp and staple that’s backed up with coach bolts. Don’t forget to secure the shed outside with a sturdy padlock – ideally weatherproof or rustproof. Once the criminals see that your shed is all locked up, the more likely they will avoid it increases their chances of getting caught. While if you’re open to a more advanced, high-tech form of security, think of investing in an electronic door lock. Check on your shed door’s hinges. If they are already loose and exposed, it can be easy to unscrew them and enter the shed. Replace your old hinges with those that come with a non-removable pins. These will make your shed much more secure as intruders won’t be able to tap out the pins unlike with regular, removable pin hinges. It’s also a good idea to use coach bolts or carriage screws when installing the hinges because these types are hard to remove from the outside when they’re screwed in. Strangers or contractors might have entered your shed while you weren’t looking. This could give them ample time to jam your door clasp of unfasten a window for easier access. Window and door alarms come handy in these kind of situations. If you have a monitored home security system, include your storage shed within its reach. But if you don’t feel the need for that, installing a basic DIY wireless security system works just as well. Look for a security system that can alert a monitoring company or send you a warning once the alarm is triggered. This will incredibly help in quickly determining when someone attempts to access your shed. Uncovered shed windows will tempt strangers and passers-by to look into your structure when there’s no one inside. Avoid giving an all-access pass to your shed’s content by installing curtains or other forms of window coverings. The style depends on how you intend to use your shed, but make sure they’re secure enough to hide everything that’s inside. Dark corners allow intruders to freely move as nobody would see them. That means if your shed is placed far away from any light source, it will be easy for thieves to get in. Motion detector lighting is the best solution for this. Putting burglars in the spotlight will surely do the job. If you want to keep the whole property safe, install in lighting that has a wider range so you can detect intruders from all areas of the house. Why not have a look at our garden shed customer stories?